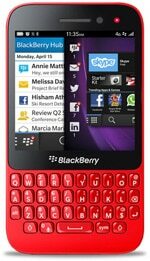 The BlackBerry Q5 is a mid-range smartphone with a Qwerty keyboard that runs Blackberry 10 OS and is available in versions with and without NFC. It includes a 1.2GHz dual core processor and features a 3.1-inch 720 by 720 pixel touchscreen. The handset supports Bluetooth 4.0 and has LTE connectivity. It also includes a 5MP rear camera capable of capturing 1080p HD video. The handset is aimed at emerging markets and not at all versions of the Q5 come with NFC. Those that do are slightly thicker than non-NFC models, at 10.8mm compared to 10.5mm. The Q5 was announced in May 2013 and became available in July.